Vase and Flowers is an excellent quality digitally rendered 3D wallpaper of two white Vases with purple colored flowers. Vase and Flowers Wallpaper is created by THE-LEMON-WATCH using 3DS Max. The original name of the wallpaper, given by the artist is Alien Experience. We have posted other fantastic works by the artist before, you can check Virtual Glass Wallpaper as well. 1680Ã—1050 pixels ; resize if needed. It is a PNG download, the file is 1.5 MB in size. This Article Has Been Shared 8644 Times! Tetris 3D Wallpaper Pack is an excellent quality digitally created 3D wallpaper that comes in different sizes. nVidia 3D Logo Wallpaper is an excellent quality digitally rendered 3D wallpaper of nVidia logo. The creator has done two types – one is pixelated and normal. Simple and Dark Wallpaper is a Royal Black excellent quality digitally rendered 3D wallpaper and is suitable for using various matching widgets over it. 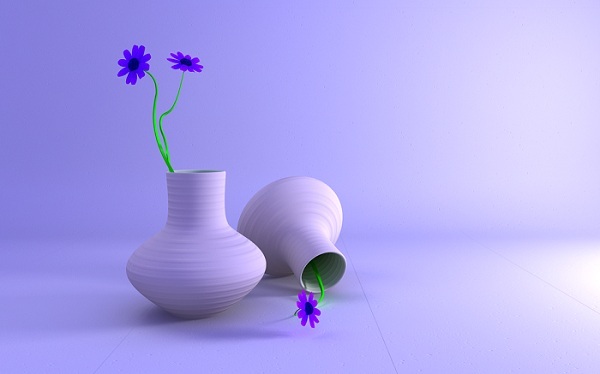 Cite this article as: Abhishek Ghosh, "Vase and Flowers digitally created 3D Wallpaper," in The Customize Windows, September 2, 2011, April 18, 2019, https://thecustomizewindows.com/2011/09/vase-and-flowers-digitally-created-3d-wallpaper/.